Maximum Business Advantage works with your People, managers and leadership to create efficiencies, reduce redundancies and develop a consistently excellent Customer Experience that increases your overall profits. The downturn and slow time is the best time to call – we can help you prepare for increased customers while helping to ensure that you survive and thrive when others are hurting. We put you and your employees in your customers’ shoes, enabling enhanced service delivery that will delight your customers – so they return, spend more, and refer their friends. 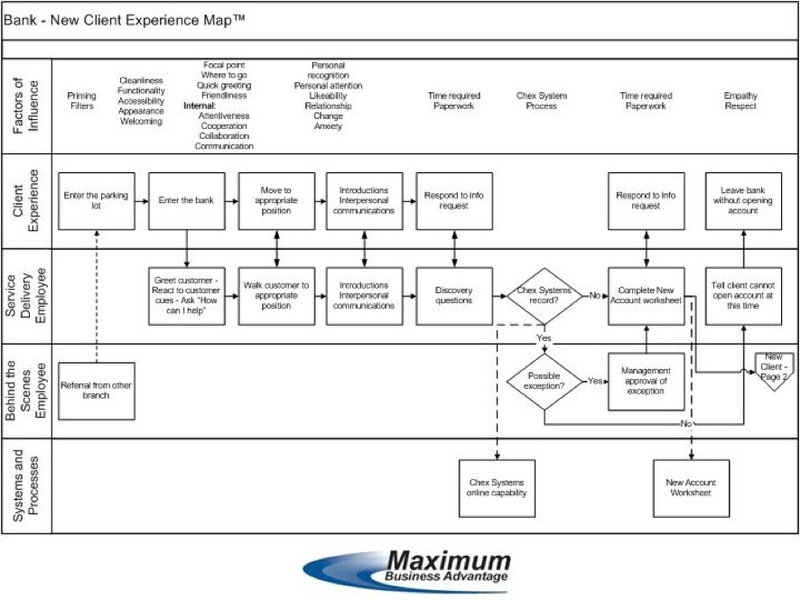 Below is a sample Experience Map™ that demonstrates a portion of the process for a bank creating a new client account.